Why are apparently simple problems so difficult to solve? A Rubik’s cube appears an impossible puzzle for the uninitiated. If you don’t know how to do it, it could take days and weeks of ‘trial and error’ to solve the puzzle. And yet the current world record was set by Erik Akkersdijk in 2008, with a best time of 7.08 seconds at the Czech Open 2008 competition. Similarly, the puzzle of improving service process productivity has appeared to be frustratingly difficult for many organisations. Dedicated teams are formed, apply huge amounts of effort over 6 months and yet end up with service productivity improvements below 10%. The secret to transforming your performance in both cases is knowing the most effective strategies to deploy to be successful. So let’s explore in more detail what makes service productivity improvement so difficult using conventional approaches and alternatives you can apply to achieve rapid breakthrough productivity improvements. Our lives depend on service processes and they are critical to the success of business and society. They range from ordinary activities such as withdrawing cash from an ATM and changing the calling plan for your mobile phone through to arranging for an operation in the Health Service. In business terms they cover the back office processing in a financial institution through to the restocking processes that ensure your supermarket is replenished each day. Without these ‘invisible’ service processes our shops would stand empty and life would soon grind to a halt. What are the elements of a service process? iii) The supporting processes to make them work. For example for a cash withdrawal service through an ATM from your bank, the features could include withdrawals up to $500, 24 hours per day, 7 days per week. The delivery mechanism is through any ATM displaying the Visa symbol in 170 countries using your bank card. The service process from a customer perspective starts by inserting your card and entering PIN, then making a withdrawal request for any amount up to $500 and finally receiving the cash (if you have the money in your bank account) and having your account debited for the transaction. Why do service processes get so complex? There are a number of factors that combine in my experience to lead to process complexity. The first is that while the features and delivery mechanisms are tangible whose performance can be easily defined in engineering terms with hard metrics, the service processes being ‘invisible’ are much harder to engineer systematically and so often get overlooked. If you consider your doctor making an outpatient referral for you for a consultation with a specialist consultant; you’ll find that nearly every hospital and health authority will have a different service process with huge variations in terms of how quickly you are treated, the cost per treatment and medical outcomes. In my experience, new service processes are typically launched with poor productivity; complexity is then added with new rules and decision points to be applied continually with constant further workarounds and hand-offs being created. Each time complexity increases; the amount of work per case goes up undermining your productivity and driving up costs. You could think of the eventual impact as a process version of the movie ‘Super Size Me’. You don’t notice the impact of the first few super-sized burgers, however the cholesterol from each additional super size burger clots up your arteries until eventually a heart attack occurs. Similarly as the added complexity builds up over time and volumes grow day-by-day, the process cholesterol builds up until you suffer an eventual ‘process heart attack’ as either processing costs explode or your service delivery functions collapse from being overwhelmed by too much work. Why does productivity get compromised in new service processes? In a new service process, even though it shouldn’t happen in theory, in practice the requirements set for new processes end up being far too complicated. Far too many requirements are included from all parts of the organisation (marketing, finance, audit and compliance). All too frequently, this is combined with a ‘hard date’ for when the new process must be implemented, so as the target date nears the project team (and the operational departments) are forced to come up with a working process no matter how complex to ensure the target implementation is seen by to be met (or face the wrath of the senior executives who are paying for the project). Worst-case scenario is a Heathrow Terminal-5 disaster on Day 1 but to be frank these disaster scenarios are the exceptions. In most cases a more insidious problem is building up unnoticed. The initial volumes for the new process are relatively small, so the operational departments can cope. The project team is then stood down and moves onto another process leaving their operational colleagues to run the new process. As long as the volumes remain low, nobody notices the problem. You can think of it as an unexploded bomb just waiting to be set off on the operational folks once volumes reach a critical mass. How does complexity impact service processes? The more rules, the more hand-offs, and the more decision points within a service process the more complicated it gets. It seems obvious but is so often overlooked – the more complex the process the greater the costs and the more opportunities exist to disappoint the customer. Typically, 40-60% of activities and costs within a service process are non-value added from a customer perspective. Some of this cost may be justified from an audit and compliance perspective but this should be contained to below 5%. If service processes are a major proportion of your operating costs or service quality is critical to your business proposition and operations then this level of waste is both a significant burden and a major opportunity for you to improve performance. What are the best measures of service productivity? The most powerful measures of service productivity are based on focusing on the customer and business performance. The top-three performance measures, I would recommend that you implement are: are a measure of your ‘customer experience’ (such as the ‘Net Promoter Score’ (NPS) or equivalent), cost per activity and a measure of the effectiveness of your process outcome (depending on your business this could be customer lifetime value, asset utilisation, sales per square foot, patient outcome etc). What's the easiest approach to eliminate complexity? The simplest and most powerful approach in my experience is to attack the complexity head on. There are straightforward tools that help you to identify the principal components of service process complexity. You simply need to apply a ‘triage approach’ to generate an action plan that removes those elements of complexity that generate the greatest cost and customer dissatisfaction in the fastest time. It sounds simple because it is and it’s an approach that works. Why do so many IT based productivity implementations disappoint? My background is in IT and I’ve worked with a number of the largest IT firms and users in the world such as AOL, Citicorp and EDS. I love IT and spent many happy years as a programmer, business analyst and systems designer. Clearly some IT initiatives, such as increased ‘straight-through-processing’ in transaction processing, environments are ‘no-brainers’ as they eliminate work. Well yes they are, but these often make up a minority of the initiatives within the typical IT portfolio. So what’s the fatal flaw that causes so many of the IT investment projects to deliver minimal productivity impact? My observation is that these projects start off by mapping the data, document and process flows within the existing process. By and large, the process is then engineered into an IT process that preserves most of the complexity in the original process. Indeed in some cases it’s made worse because the new IT system can now administer far more rules and complexity than was possible before. So the new (IT system enabled) process starts off with even more complexity than ever. Ultimately the new IT system, even with the latest workflow, image, SOA and web-enabled functionality fails to deliver the goods in terms of meaningful improvements to your productivity, customer experience or operating costs. Who needs to be involved in removing complexity? To achieve the best results, ideally you should get 2 to 5 people (from the function that operates the service process day-to-day) that can describe the process end-to-end. A smart front-line person and a team leader/ supervisor are often enough. Typically, just these two individuals can identify 20-40% of the performance improvement opportunities available. In an ideal world, if they could be joined by 1-2 people involved in the process upstream and downstream then you can identify 80%+ of the opportunities. For the icing on the cake, if you had someone from finance who really knew the numbers and someone from marketing who defined the service offering then you would have the perfect team. All told, you will get great results from getting these 2-10 people in the same room to optimise the process. What's the impact of removing complexity? If you’ve been working for years and have now hit-the-wall on delivering further productivity improvements then no doubt this discussion of rapid productivity gains no doubt sounds ‘too good to be true’. If you’ve used techniques derived from manufacturing such as Lean and Six Sigma, you may be wondering what these alternative approaches designed for service processes have to offer you? If you are working on manufacturing processes in an automotive company, than Lean techniques represent global best practice and many of the planning and analysis tools can be used in any environment. However even a world-class manufacturer such as Nissan realised there was much it could do to improve its service processes when Carlos Ghosn joined from Renault. One year after he arrived, Nissan's net profit climbed to $2.7 billion from a loss of $6.1 billion in the previous year. Nissan's operating profit (EBIT, or earnings before interest and taxes) margin increased from 1.38% in FY 2000 to 9.25% in FY 2006. The application of Renault’s expertise to critical service processes within Nissan enabled it to transform its profitability. Perhaps the most powerful argument is that if you’re finding your existing tools and approaches are not delivering the results that you need, perhaps it’s time to consider an alternative approach, an approach that you could learn in a day and start seeing immediate productivity improvements this week. What are the most powerful ‘takeaway points’ for you to consider? So if you want to learn how to solve a Rubik’s cube puzzle, just key ‘Rubik’s cube solutions’ into Google and you’ll know how to do it in the next hour. If you are interested in learning more about how to increase service productivity by 10-15% in the next 90 days just apply the principles you’ve just discovered. Tel: +44 (0) 20 7748 2225. PS If you would like to discuss these principles in more detail or for a confidential conversation on how they apply to your specific situation, challenges and objectives - just drop me an email or call. I’d be delighted to help you be more successful. Through 2009 we ran a survey, for a large part in conjunction with LinkedIn. Thank you to all the contributors especially so the BP Group (www.bpgroup.org) membership. 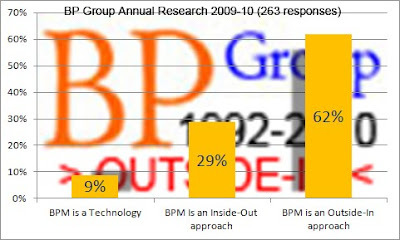 BPM will never die. It may change names and technology, but never die. It is essential for continuous improvement. Without continuous improvement an organization dies. By Fred Held Former Marketing and Operations Executive Mattel for McDonald's and Burger King. Process improvement is essential, however the vernacular will continue to evolve. By Nilson Musa Quality & Corporate Process Manager at Brasil Telecom. It's crazy that so many organisations still focus on the inside-out approach. It seems that fundamental marketing practises are forgotten as soon as we get to work. I still recall Kotler from my MBA over 10 years ago defining marketing as understanding and producing what the customer wants... When we link our internal processes and architecture to truly deliver that then we succeed! Imagine designing anything from the inside out. What is the likelihood that if you had all the components of a car designed separately that it would ever fit together? What if you designed a house by having people design each room and then see how they fit together. A design principle is: Top Down Outside In. You can join the follow-up survey here - Is your business 'Inside-Out' or 'Outside-In'? ASSAD MIRZA - Why does Lean/Six Sigma fail? +++++ New CPP Masters +++++ CONGRATULATIONS!